The University of Waterloo is a comprehensive public university in the city of Waterloo, Ontario, Canada. The school was founded in 1957 by Drs. Gerry Hagey and Ira G. Needles, and has since grown to an institution of more than 30,000 students, faculty, and staff. 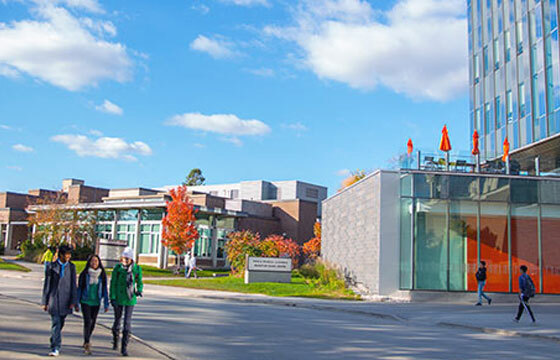 The school is notable for being the first university in North America to create a Faculty of Mathematics, and for having the largest co-operative education program in the world. Maclean's Reputational University Rankings for Canadian universities has consistently ranked UW first in the "Most Innovative" and "Leaders of Tomorrow" sections, and second in the "Highest Quality" section. The school is also known for having more company spin-offs than any other Canadian university. As of Fall 2009, there were 26,451 full-time (1,628 part-time) undergraduate and 3,505 full-time (921 part-time) graduate students, with 1,047 full-time faculty members and 2,184 staff. The school has approximately 151,000 alumni in 143 countries. The main campus is located along University Avenue in Waterloo, Ontario on what was, until the 1960s, farmland. Since its creation, a considerable level of commercial and residential development has built up around the Waterloo campus, notably with many offices of high-tech firms. A new campus for the health sciences program has been built in Kitchener, Ontario and includes a satellite of McMaster University's Michael G. DeGroote School of Medicine and the School of Pharmacy. Waterloo offers a number of scholarships, which range from $500 CAD for one year to $40,000 CAD over 4 years. In most cases, these scholarships are based on academic performance and do not require a separate application. The exceptions are some scholarships for Mathematics, Computer Science, and Accounting and Financial Management. The UW International Student Scholarship is open to all international students admitted to Year One of a full-time, undergraduate degree programs at Waterloo, Cambridge, or the UAE campus location. Several are available, valued at $10,000 each. These scholarships are awarded based on grades (minimum of 90%), the Admission Information Form, and in some cases additional admission requirements (i.e., Euclid Math contest, Accounting and Financial Management Admission Assessment). The Engineering International Scholarship/Grant is open to all students entering first-year Engineering on a study permit. Valued at $5,000 CAD a year, the grant is awarded in recognition of outstanding academic and extracurricular achievement, and higher costs for international students. It can be renewed in your upper years. The Mathematics/Financial Analysis and Risk Management International Student Award is open to all students entering first-year FARM on a study permit. Valued at $5,000 CAD a year, the grant is awarded in recognition of outstanding academic and extracurricular achievement and higher costs for international students. It can be renewed in your upper years.